NEW YORK CITY, it’s going down! 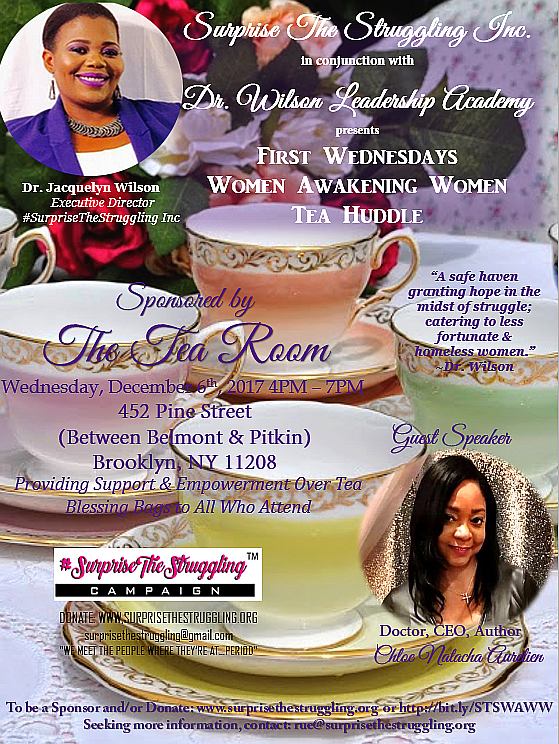 Women Awakening Women Tea Huddle, sponsored by the Dr. Wilson Leadership Academy and The Tea Room in Brooklyn, is returning on December 6, 2017, starting at 4 PM. Our special guest speaker will be Doctor, CEO, and Author Chloe Natacha Aurelien. The Tea Huddle is a safe space for sacred conversations over tea and a light meal for less fortunate and homeless women in our communities. If you would like to be a blessing and donate, no amount is too small, please visit our Giving Back page for the donate button. Or you may email surprisethestruggling@gmail.com We meet the people where they are…PERIOD! Next PostNext It’s A Surprise Holiday Dinner Party!